The steel hull of this Skorpion 1200 was built 1984 by Feltz in Hamburg, Germany. I completed the interior and all deck fittings myself, and launched her in 1986 (all VAT and taxes paid). 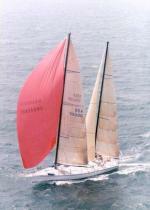 She was built and equipped for cruising and blue water sailing (our dream was to sail her around the world). She can be easily sailed single handedly or with family. With her overall length of 13m, beam 3.77m, daught 1.8m, a long keel, moderate yacht stern and traditional overhanging bow, she cuts easily and elegantly through the waves, which makes sailing with her comfortable and remarkably dry even in heavy seas. She has a fairly deep aft cockpit, so that sailing with small children is safe and sheltered in all conditions. She has 6 fixed berths: 2 in a V-shaped forward cabin, a cabin with bunks just in front of the mast, and a portside aft cabin with a double berth. The U-shaped saloon settee with table converts into another double berth, if needed. The space for the starboard aft cabin has not been fitted out and is used as storage/ engine compartment/ bike shed, increasing her ample storage space even further. The engine has been recently replaced (approx. 600 running hours) and is a 62hp Kubota diesel based Betamarine engine. The 350l diesel tank sits in the keel just above the 4ton lead ballast. 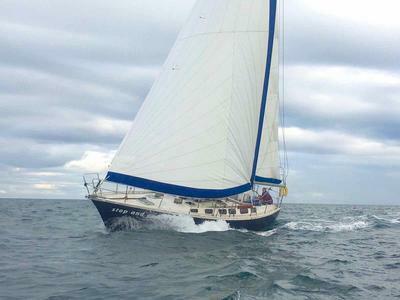 Also in the keel are two 200l stainless steel water tanks and a 90l waste water tank. Although we never managed to sail around the world with her, she has taken us on tens of thousands of miles through most of the Baltic Sea, North Sea, Irish Sea and North Altlantic. Even in heaviest weather she has sailed us safely and comfortably through rough seas. But as we are getting older, sailing mainly in cold and rainy areas, and due to increased work commitments having less time for maintenance, we are intending to replace her (heavy-heartedly) with a motor cruiser. She would need a complete corrosion check of the hull. She is suitable for someone who has the time and skill to renovate a steel hull, or somebody who is building their own boat of a similar size and seeking to use her equipment (a list of her equipment is available on request). We have just sailed with her through Scottish waters, and she can be sailed from her current location in Northwest England anywhere/anytime.